Shake up your wedding favors. Heart-shaped silver salt and pepper shakers make unique wedding favors. These pretty and unusual wedding favors are an excellent alternative to traditional favors. They are a perfect memento for wedding guests to remember this special day. Couples who are looking for something both attractive and functional from their wedding favors may find that heart shaped salt and pepper shakers are just the thing. These make a gift for guests that is pretty and practical. Before buying silver salt and pepper wedding favors it is important to research well. Silver wedding favors can be relatively expensive and therefore good research will help to avoid any costly mistakes. Research should include understanding the difference between different types of silver, silver plate, and imitation silver, as well as any other special information. Don't forget to research the manufacturer and retailer to be sure you are dealing with reputable businesses. It is essential to work out the likely cost of heart shaped silver salt and pepper shakers. As these are going to be given as favors to wedding guests a substantial number are likely to be purchased. Working out the cost should also include any discounts that the retailer offers for buying in bulk as well as any additional costs that may be incurred through engraving or other forms of customizing as well as shipping and rush orders if necessary. Many couples like to customize and personalize their wedding favors. This can be is simple is attaching a handwritten card with the name of the couple and the date of the wedding, through to more ambitious forms of customizing such as getting each salt and pepper wedding favor engraved. Before buying heart shaped silver salt and pepper wedding favors it is useful to decide what words are going to be engraved and what style of engraving is going to be best suited to complement the overall style of the wedding. Many engravers will be happy to discuss different engraving options such as the fonts used and other considerations. Silver salt and pepper wedding favors may require special packaging. This is because sterling silver can tarnish in certain environments. Fingerprints can also mark freshly polished silver wedding favors. Deciding on packaging is important as it affects the overall cost of the favors. Small card boxes are ideal for holding wedding favors, as are gift bags. Velvet or silk wedding favor bags can make a very elegant way to package heart shaped salt and pepper wedding favors. Whether a few words are going to be engraved onto the silver salt and pepper wedding favors or whether they are to be written on cards, deciding on the most appropriate words to go with the favors is important. 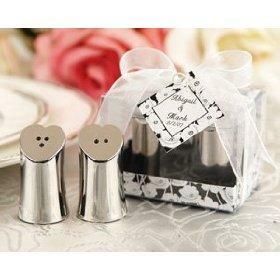 The design of a salt and pepper wedding favor may well help to inspire appropriate words. Because these are heart shaped favors, romantic sentiments are always appropriate. If a couple cannot find the perfect heart shaped salt and pepper wedding favors an alternative may be to have them custom made. Many silversmiths are delighted to take commissions and to work with people creating unique and special designs. This may be a more costly option, however, it is one way of ensuring a completely unique wedding favor. A silversmith will be able to give advice on the most economical way of producing this type of wedding favor. Sprinkle your guests with gratitude! Heart shaped silver salt and pepper wedding favors are a wedding favor that combines the best of both worlds -- practical, yet elegant -- for a perfect favor.